Deemed the “graphic arts gold standard” by Xerox, the Phaser 7800—now available at Pacific Office Automation—is a first-class printing system that is sure to help your business excel. This system keeps things moving with a quick 45 page per minute output speed for both color and black and white documents. Even with a fast-paced output, users can enjoy the vibrancy of 1200 x 1200 DPI (dots per inch) resolution on every copy, over and over. Automatic double-sided output comes standard, providing ease and efficiency—both with your time and resources. This printer also offers a number of other finishing features to contribute to the professionalism of your final products. 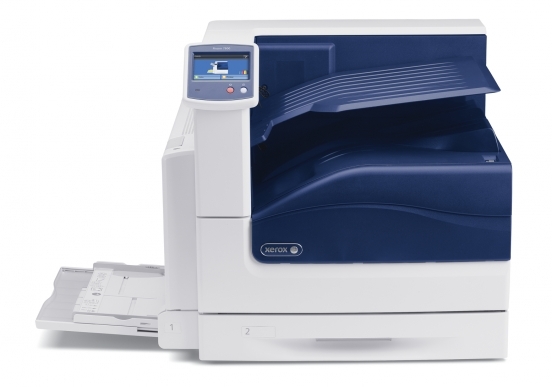 The Xerox Phaser 7800 can handle a wide range of media weights, from 75 to 350 gsm, and a range of sizes—from 3.5 x 3.9 inches to 12.6 x 48 inches. Users can customize their print jobs easily, as they quickly navigate options using the large, 4.3 inch color touch screen interface with bright icons and intuitive menus. This machine can be deeply integrated into your existing network with CentraWare Internet Services that allow users to view their job status and troubleshoot right from a web browser window. No more going back and forth between your office desktop and the group printer. In the end, customers can only benefit from the rich, sharp images produced by the Phaser 7800 and its innovative EA Toner with low-merit technology that requires a lower fusing temperature than traditional toner. Gone are the days of print outsourcing; welcome the best printer for today’s mid-sized work group.